Renovated 3 bedroom oceanfront villa with a view that never gets old! Morning, Noon & Night. When we were looking for an oceanfront villa a few years ago we had already been in a number of similar units before seeing 3208 Windsor Court South. As we entered the unit and looked out toward the beach under the massive oak tree we felt we had found one of the best views on the island. We are sure you will agree staying in our villa will feel like you are always on the beach. If you intend to rent an oceanfront villa for the view and convenience to the beach, you cannot find a better villa on Hilton Head Island. This 3 bedroom, 3 bath oceanfront villa has undergone a complete renovation. One of the best interior decorators and one of the best builders on the island were used. Everything is new and first class - kitchen, living and dining areas, bedrooms, bathrooms, media area and balcony furniture. It has 2 master bedrooms with balconies and king size beds. The third bedroom has twin beds and a living room couch that coverts to queen bed. There are 3 dining areas - dining room. kitchen nook, and balcony. Living room plus media area. Media area includes connections with Netflix, Amazon Instant Video and Apple TV. Living area has Bluetooth' speaker system. The layout of our villa is unique and different from what you will find in other Windsor and Hampton three (3) bedroom villas. During the renovation we converted what had been the dining room area into a media area and removed the television from the living room area. This was done for the express purpose of encouraging more "family time" that consisted of conversation, non-television entertainment such as reading and games and incredible view of the beach without the distraction of a television. The resort like pool area is surrounded by beautifully landscaped gardens and ponds. The pool area includes a heated pool, separate hot tub, reading deck, fire pit, grill, gazebo and children play area. Take advantage of award winning Palmetto Dunes Racquet Club just a short walk or drive away from the condo or rent a canoe and go throughout the 12 mile lagoon enjoying nature at its best. Walk to several restaurants or take the free shuttle across the street to Shelter Cove Marina for shopping, dining and entertainment. The villa is SMOKE FREE and PET FREE so please do not ask to rent this villa if either of these prohibitions are an issue. Our guests pay by credit card with VRBO's online secure checkout system. Fifty (50%) percent of rental amount is payable at time of reservation and the balance is payable not less than 60 days prior to the date of occupancy. You will not be disappointed if you choose our villa. Thank you. Great condo, beautiful views, clean, well equipped, and excellent owners. Wish we could have brought our little pooch but nonetheless it was a fantastic five weeks. We return to HH annually and now that we are retired, this condo is on the shortlist. Just an FYI for those who prefer softer mattresses, the mattresses in both masters are very firm. The grounds are beautiful and the ocean can be heard rolling up against a long sand beach steps away from the condo. This condo is definitely a ten!! Thanks to David and Jackie for making our stay so wonderful. The property was beautiful very roomy views were wonderful. Condo had everything u could need First time we stayed there and can’t wait to go back next year. None of us wanted to leave!! We had a beautiful and memorable stay in this pristine oceanfront property. The condo is very clean, modern and beautifully decorated. It has every amenity a family could need or want. We started our day with coffee on the deck overlooking the ocean and ended it in the same place gazing at the stars. Pool and jacuzzi area very clean as well. We can't think of a better place to spend quality time with those you love! We had a great week. The weather was very good. The condo was decorated nicely and well furnished. The visit was great and very relaxing. 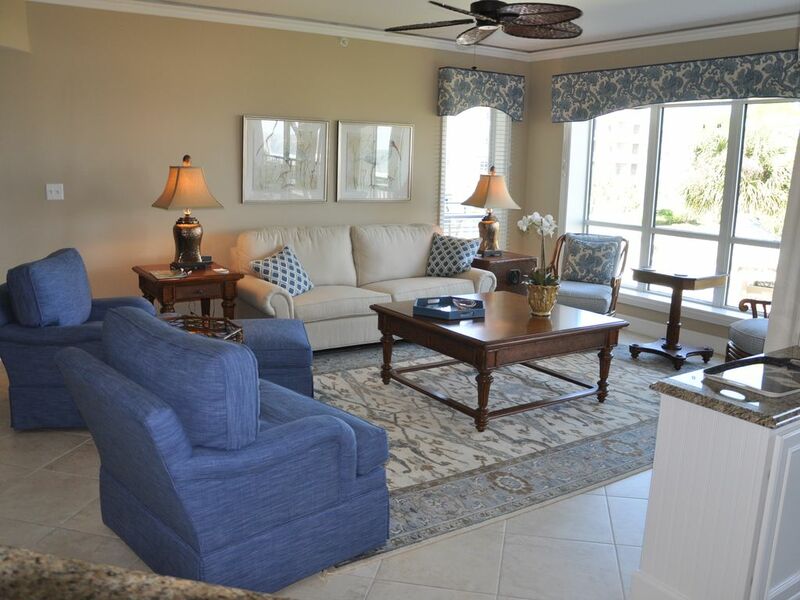 The Mason condo is beautiful and well furnished with great pool and beach views. We plan to stay again in the fall if possible. After 18 years vacationing in Hilton Head, this condo was by far the nicest accommodation we have found to date. The pictures perfectly describe this spacious 3 bedroom condo with absolutely breathtaking sunrises and views of the beach /ocean. Jackie and David have thought of everything in outfitting this condo; it is so well appointed and a dream space to entertain family or guests. The kitchen is equipped with everything you would ever need including several complete sets of dishes, cookware, a slow cooker, Keurig coffee maker and waffle iron! We felt right at home here. They also thoughtfully supplied many kitchen and cleaning supplies. The complex as a whole is clean and well maintained. After a month vacationing here we truly hated to leave. Thank you Jackie and David for sharing your beautiful Hilton Head home with us- we have wonderful memories. Thank you for your kind and thoughtful review of our Windsor Court South villa. David and I are always pleased to know that the condo has been a warm and inviting place for our renters to enjoy while visiting Hilton Head Island. Very nice condo with great views. First class furnishings. Our stay was great. The condo was very well furnished and decorated.